October is ‘Breast Cancer Awareness Month’! Here’s How You Can Help! This month, your help is needed more than ever to take action against breast cancer and create a future where everyone who develops the disease can live.... and live well. October is Breast Cancer Awareness Month, a worldwide annual campaign involving thousands of organizations, to highlight the importance of breast awareness, education and research. During Breast Cancer Awareness Month we aim to get as many people as possible involved in raising awareness and funds for breast cancer research. More of us are being diagnosed with breast cancer than ever before and the disease is still devastating lives on a heart-breaking scale. We can’t live with that and we’re pretty sure you can’t either. "Thanks to largely stable incidence rates, improved treatment, as well as earlier detection through screening and increased awareness, a woman's risk of dying of breast cancer dropped 39 percent between the late 1980s and 2015, translating into more than 300,000 breast cancer deaths avoided during that time. Despite that progress, there's much more to be done. 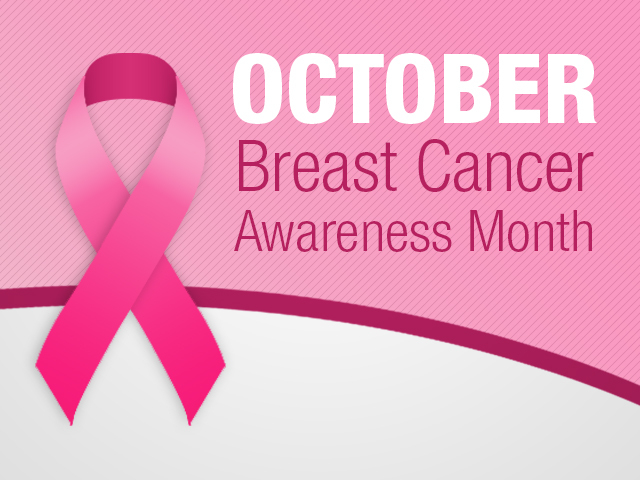 Breast cancer is still the second-leading cause of cancer death in women, second only to lung cancer. There is still a large racial gap in mortality, with African-American women having higher death rates compared to whites, even as incidence rates are similar." - About 266,120 new cases of invasive breast cancer will be diagnosed in women. - About 63,960 new cases of carcinoma in situ (CIS) will be diagnosed (CIS is non-invasive and is the earliest form of breast cancer). - About 40,920 women will die from breast cancer. - While black and white women get breast cancer at roughly the same rate, the mortality rate is 42% higher among black women than white women. * Numerous studies have confirmed that alcohol consumption increases the risk of breast cancer in women by about 7%-10% for each one drink of alcohol consumed per day on average. Women who have 2-3 alcoholic drinks per day have a 20 percent higher risk of breast cancer compared to non-drinkers. * Obesity increases the risk of postmenopausal breast cancer. Risk is about 1.5 times higher in overweight women and about 2 times higher in obese women than in lean women. * Limited but accumulating research indicates that smoking may slightly increase breast cancer risk, particularly long-term, heavy smoking and among women who start smoking before their first pregnancy. While breast cancer is largely a female disease, breast cancer does affect men. Around 350 men are diagnosed with the disease each year. Be sure that you and your husband know the signs and symptoms. *If you or someone you love are concerned about developing breast cancer, has been recently diagnosed, are going through treatment, or are trying to stay well after treatment, the American Cancer Society provides important information on these topics and more. If you or someone close to you has been diagnosed with breast cancer, you’ll know it’s vital that women check their breasts regularly. But sadly, lots of women out there don’t check. 'Wear it pink' is the biggest fundraising event of the year for the organization, ’Breast Cancer Now’, and it couldn’t be easier to join in. Whether you’ll be at work, school or in your community, all you need to do on Friday 19 October is wear pink and raise as much money as you can to help make life-saving research happen. Act now and join the #55000Reasons campaign. The real experiences of the 55,000 people diagnosed with breast cancer every year in the UK – and their family and friends – represent real reasons why politicians should invest in breast cancer services. Tell us how breast cancer has affected your life and we will share it with the Secretary of State for Health, Matt Hancock MP, to make sure breast cancer services get the funding they need from NHS England. A Fund in Memory is a personal and very special online space, created by you in memory of your loved one. It gives you a page where friends and family can come together to share their fondest memories and raised money in your loved one’s name for breast cancer research. Look out for the various campaigns going on, not only throughout the month, but all year long. It just takes a few minutes to check on Facebook, Instagram ,and Twitter and share with your friends and family to help spread the word. One of the best things you can do is to be informed, as well as informing others. Working together to fight against this form of cancer (and all forms of cancer) is such an important part of prevention and helping to eventually eradicate this disease. Join us to paint a beautiful 'Breast Cancer Awareness' butterfly on a glass vase. This would make a wonderful gift for someone who is fighting or who has won the fight against breast cancer. In addition to this class, we have tons of other paintings on the calendar, so be sure to check out the link at the bottom of the page to see what’s coming up! We hope to see you soon, and from everyone here at Pinot’s Palette-Edwardsville, we wish you a wonderful month, full of love, beauty, and self-health awareness.